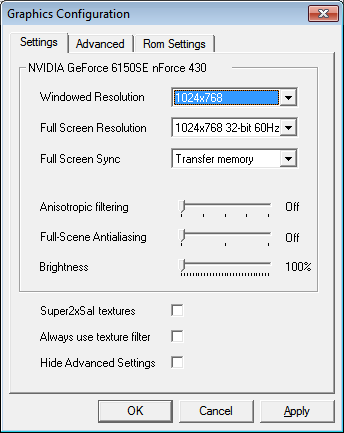 The res settings are completely irrelevant to how they display on the application, only in the game. Wait I got a idea. I really want to know if its not just me. So anyone here who has Windows 7 can you please use Mupen 64 and use Jabo Plugin. And tell me if its kinda over lapping at all? I just upgraded to Windows 8 Consumer and I used to have it on my Win 7 machine, never used Mupen though. Always stuck with Project 64. (Obviously) much better and faster/lighter. Can't remember having overlapping problems. Well my laptop had a problem I had to do a factory restore. Anyway I took a closer pic of my problem and. Chances are i'm thinking its my video card that makes this window problem. And i'm also using the 1600X900 as well. So anymore ideas before I get my money and go out to best buy and buy my self a new video card? If you dont have text overlapping on your other windows applications besides your emulator and modding tools please, do NOT purchase a video card! Well then I wonder why this is only happening to me and no one else then. All i'm thinking its my video card but if you think its something else please do help me. You've changed the style - your bar is red, I imagine your fonts are also changed, they are probably too large. Well I return everything back to its windows default. And its still mess up. I still have no idea why this is happening. Then I lowered the fonts to the lowest I can get and its still messing up. I tried it and so far it did not work. By the way love your theme looks like windows 2000. Anyway I took a pic and its still having the problems. To me I think its nothing about my font so far. Well I only had 2 videos drives to pick from. Using others and it force to stop installing. And when I tried the other video card option. It display everything right but Mupen and other programs that had the overlapping problem will not load. I had to revert back to my old card so things will load. Any other Ideas? have you tested other versions of MUPEN? even the latest command line versions with a GUI? have you gone to forums that chat about the cards you have? Well ill give another version of Mupen 64 a go. But if it still leads to the same problem. Do you know of a good video card to buy? By the way I may as well tell you my video card. Its a Intel(R) HD Graphics Family. Just in case if anyone wanted to know. I swear, if you purchase a damn video card because of a simple text overlap I'm going to explode, not kidding you. Really, it's quite obviously the font size. You can tell not just from the spacing but from the difference in size between the tab labels and option labels. I thought online compatibility was based on checksums versus ROMs and program versions. A resource modification shouldn't throw either of those. He wasn't kidding! Actual live feed from his webcam!